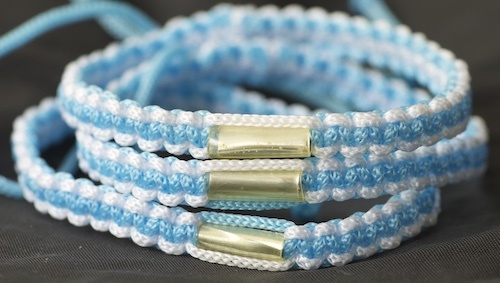 This Thai Bracelet fits nearly anyone’s wrist from 5″ to 8″ (13 – 20.5cm) in circumference (around). 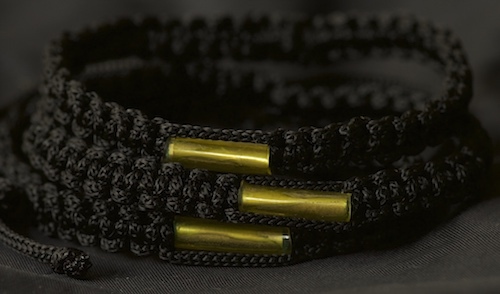 This is a new bracelet, we have had many requests for black bracelets, but prior to this the temples did not have them to buy. Now we have them – order quickly if you want some, we only have a small number. This is a new bracelet we recently found at the temple in Nakhon Si Thammarat. 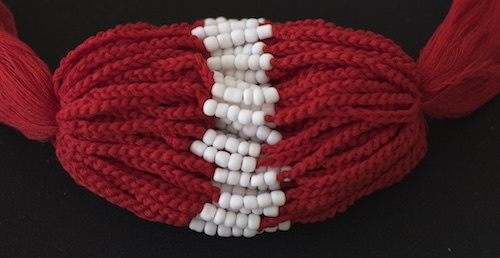 We have had many buyers ask for white and black bracelets – now we have them both – until they sell out. 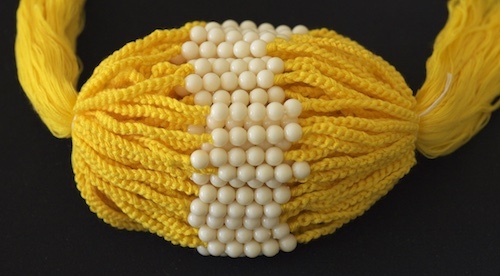 Bracelet fits nearly anyone’s wrist from 5″ to 8″ (13 – 20.5cm) in circumference (around). Hard to see in this photo – we know. 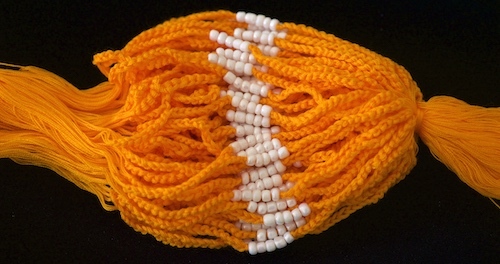 We did get a small number of this unique colored bracelet. We will try to take another photo when we have time to better show the pink! 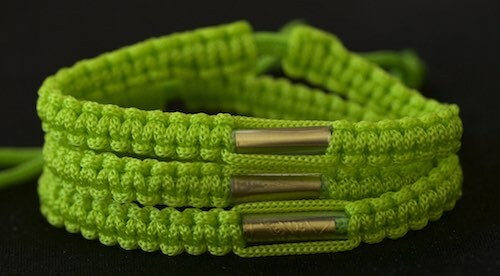 This is a bright lime green color on the outside, and a bright white center bracelet. This is one we’ve had for a while and never realized we didn’t have an order button for it! We have a limited quantity of these available. Again, the green on this is more like a very light olive green, or glowing green. It doesn’t glow, but it has that same light greenish hue to it. These are really feminine, lovely gifts for mom, sister, wife or girlfriend. 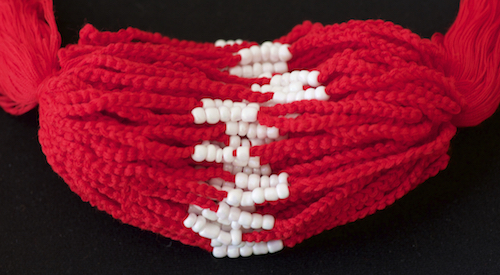 This Sai Sin bracelet fits nearly anyone’s wrist from 5″ to 8″ (13 – 20.5cm) in circumference (around). 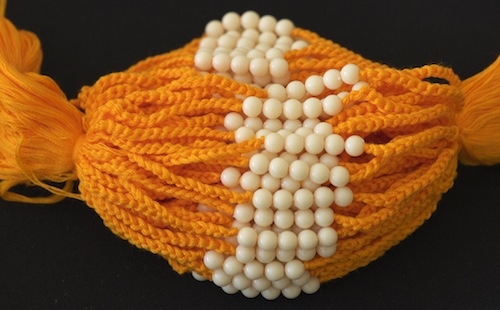 This lovely Sai Sin bracelet fits nearly anyone’s wrist from 5″ to 8″ (13 – 20.5cm) in circumference (around). Very few of these left – order quick if you want one. 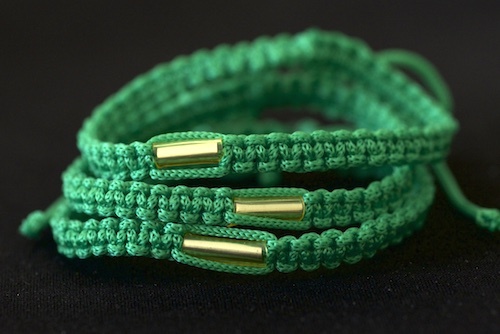 We just got another group of these bracelets in after selling out all of our others in this style. If you want this for your children, order fast because this batch will not likely last either. We have this – please ask. We will add to inventory soon. We only have a limited number of these (<20). We might be able to get more if you want them in bulk. 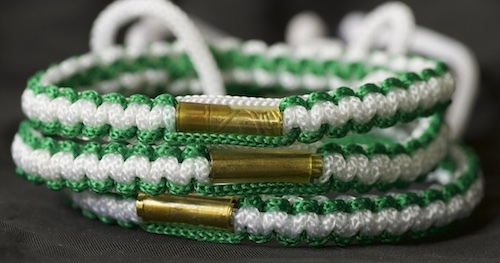 We have many green and white bracelets, this is the darkest green of all of them. 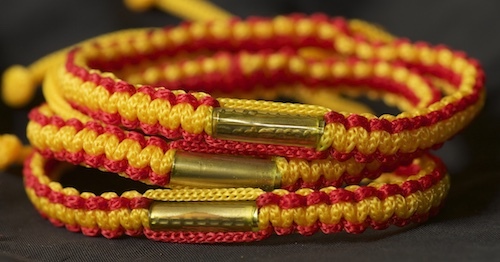 This is a new bracelet, we are going to start adding new bracelet colors to this page – keep watching. We weren’t originally going to to cover the odd color combinations, but then I realized, what we consider out of the norm – others might love. 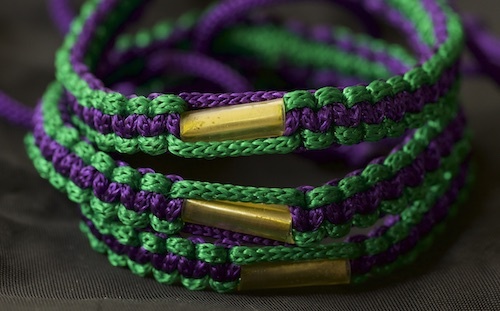 We’ll start stocking bracelets of all sorts of colors and schemes. 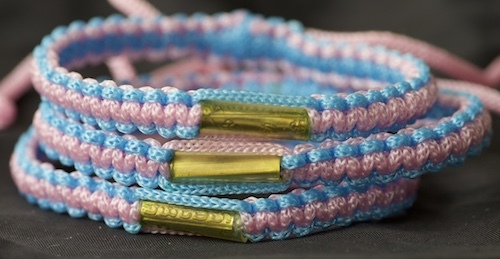 We have a number of these traditional colored temple bracelets. Brown is the color of the bracelets the temple gives us when we go to visit. 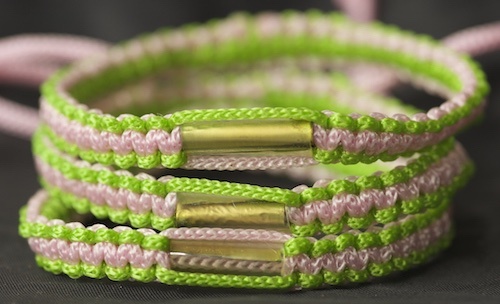 They have simple braided bracelets with two loose ends they tie together. Most people wear them until they either fall off or get too dirty to wear (smell!) 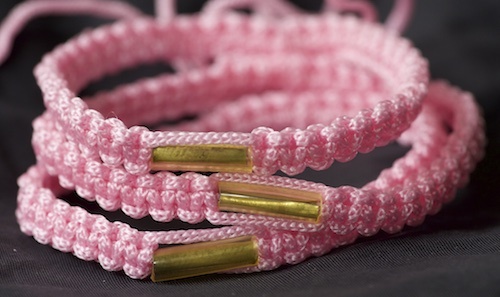 Those are cotton bracelets. These are nylon and don’t dirty as easily. This is one of my husband’s favorite bracelets. He likes the traditional brown color, but the gold adds a nice touch. One of our favorite styles, and we are down to maybe 20 left. This bracelet has the smaller scroll style. This is a new bracelet the temple started carrying recently. 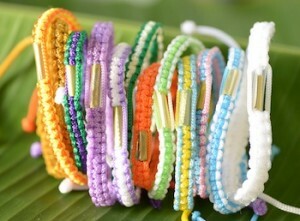 In fact, there is a whole array of solid color bracelets we can choose from. If you have a specific color in mind that we do not offer here – please let us know so we can buy them next time we go to the wat (temple). 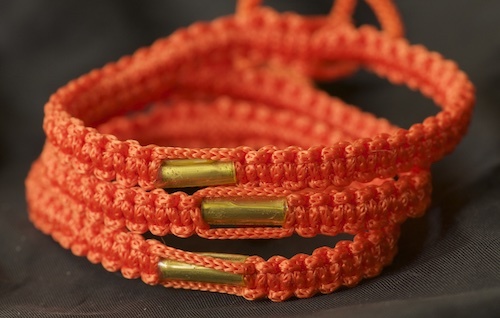 NOTE – we also have some darker orange bracelets now, and no order button for them. 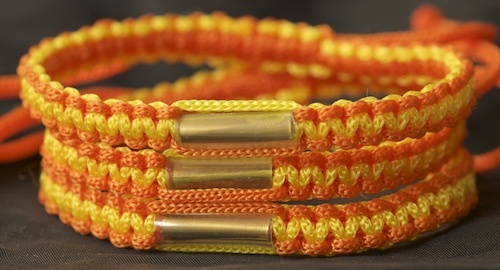 If you would prefer a slightly darker shade of orange – please email us and let us know after you purchase your bracelets here on the left using that order button. Another new color, this is almost gold in color. Another new color, this is like a sky blue, light blue color. 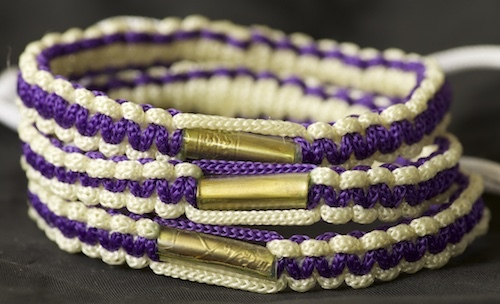 Another new color, this bracelet is a lovely shade of purple. This is a new color for 2019. 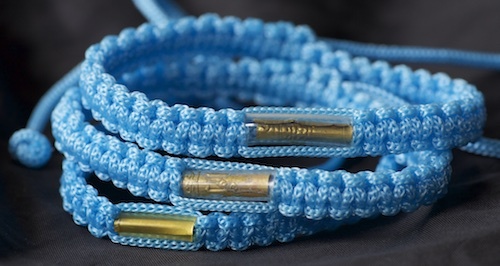 All of our bracelets are made at Theravada Buddhist temples in Thailand, and their construction and authenticity is guaranteed 100%. 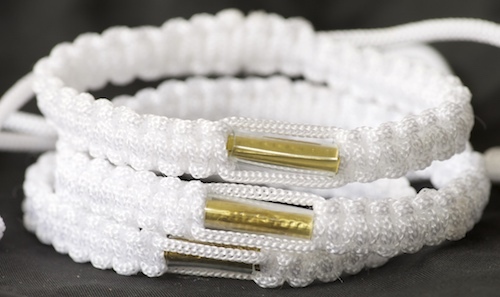 We buy all of our adjustable blessed Buddhist bracelets directly from Buddhist temples. We do not buy any items found at ThaiAmuletSales.com or AllBuddhas.com from jewelers or other amulet dealers in Thailand. We refuse to do so. 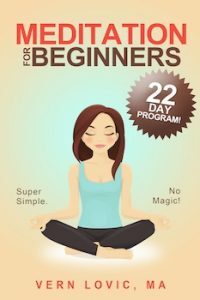 By buying only at legitimate Buddhist temples you can be assured that you are not getting scammed – because we have not been scammed. 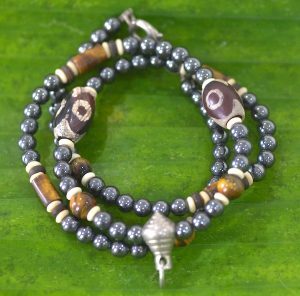 Buddhist temples don’t lie about the materials used in manufacturing these Sai Sin bracelets, necklaces and other products – and we simple relay the information to you. 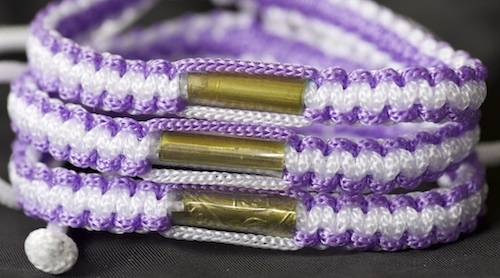 These are nylon cord Thai bracelets with a rolled metal Buddhist prayer scroll in each one. The sizes of these scrolls varies – and we try to match up the size if you order more than one. This scroll is called a “Takrut” in Thai. Takruts change color as they age – this is normal, not a flaw, they are thin brass, bronze, or tin leaf. They have many applications, but in the case of the bracelets they are scrolls with prayers for the wearer’s health and safety primarily. NOTE – if you want, you can remove the takruts as they change color. Many people do this, and the bracelets last for much longer, in a nicer condition. 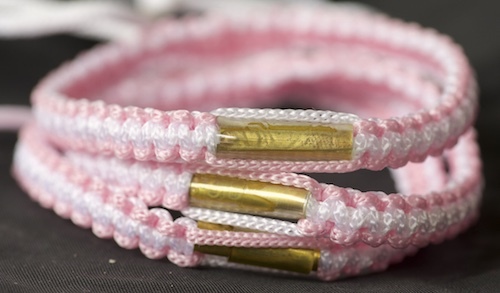 Or, if you are not Buddhist, just remove the scrolls and their plastic cover, so you have a friendship bracelet. 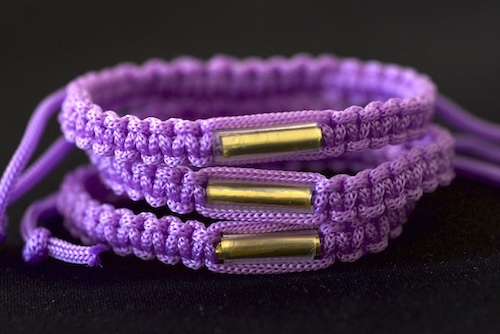 Note – this is our first page of bracelets, we have revised the site and now have a shopping cart of bracelets for sale. 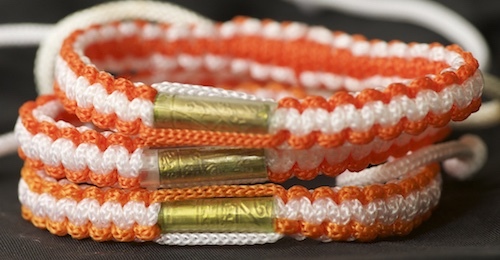 Remember – you can get a bulk discount when ordering multiple bracelets, just choose from the drop down menu. Thank you for your kindness in using our website to make your Buddhist purchases. Bulk Sai Sin Bracelet Orders? 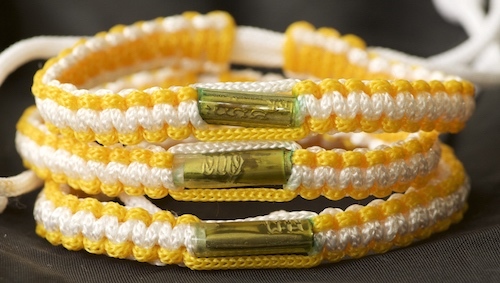 If you want to order many Thailand bracelets – 50 or more – let us know, we’ll see if we can get them. 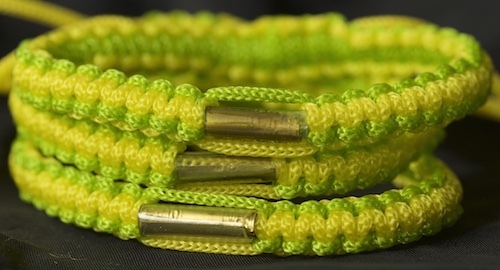 We always have on-hand a couple thousand bracelets we’ve purchased in advance. We can also get more if necessary. 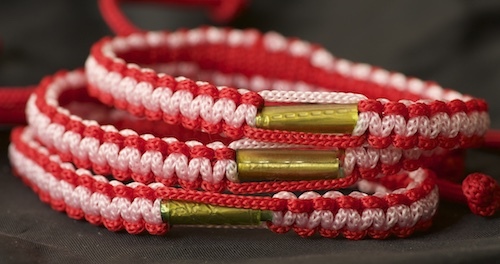 Some buyers are using these as friendship bracelets and giving the away to friends in their close network, and gifting them to others across the globe. Good idea! The temple only has a bowl of a hundred or so out on display, but they usually have more in the back if we want them. and with free shipping worldwide! Hi, do you sell the plastic bangle with gold leaf inside? I don’t think so Sara… sorry!